Eine häufige Ursache der Herzinsuffizienz ist die dilatative Kardiomyopathie (DCM). Sie ist in ca. 20–30% genetisch bedingt. Eine Familienanamnese und eine kardiologische Untersuchung von Familienangehörigen sind daher bei jedem Patienten mit einer bisher in der Ätiologie ungeklärten DCM sinnvoll und empfehlenswert. 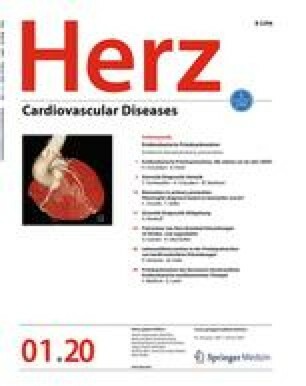 Für die Klassifikation einer familiären DCM sollten die Kriterien der “Collaborative Research Group of the European Human and Capital Mobility Project on Familial Dilated Cardiomyopathy” zugrunde gelegt werden. Die Variabilität der Erkrankung ist selbst innerhalb einer Familie sehr groß, so dass Genotyp-Phänotyp-Korrelationen nur mit diesen Einschränkungen zu betrachten sind. Bisher sind Mutationen in 24 Genen bekannt, die zu einer familiären DCM führen können. Mutationen im β-Myosin, Troponin T und Lamin A/C sowie Dystrophin sind relativ häufige Ursachen der familiären DCM, während Muta tionen in allen anderen Genen selten als Ursache in Frage kommen. Ein systematisches Screening aller bekannten Gene würde nur etwa 20% der Fälle aufklären und ist derzeit noch zu aufwendig. Es ist zu hoffen, dass weitere Gene identifiziert und effizientere Screeningmethoden entwickelt werden. Denn erst ein anderes Verständnis der Pathogenese der DCM wird auch zu prinzipiell neuen Therapieoptionen für diese maligne verlaufende Erkrankung führen. Dilated cardiomyopathy (DCM) is the most frequent form of primary myocardial diseases and the third most common cause of heart failure. Clinically, DCM is characterized by a progressive course of ventricular dilatation and systolic dysfunction. The life expectancy is limited and varies according to the underlying etiology with a median survival time of about 5 years after diagnosis. Myocarditis, immunologic abnormalities, toxic myocardial damage, and genetic factors are all assumed to be causes. Familial occurrence of DCM, mostly as an autosomal dominant trait, is more common than generally believed and is responsible for 20–30% of all cases of DCM. Candidate gene screening and linkage analyses in large families were successful in identifying 24 disease genes. There is a wide variability in the onset, course and severity of the disease even within the same family. In addition, genotype-phenotype correlations included only small numbers of affected. This implies that in most cases no conclusion can be drawn from the clinical manifestation of DCM to the responsible disease gene. Mutations in the β-myosin heavy chain and in cardiac troponin T are common causes of pure familial DCM. DCM associated with conduction disease is mainly due to mutations in lamin A/C and X-linked DCM is often caused by mutations in dystrophin. All other disease genes are rare causes of familial DCM. Genetic screening in all known disease genes is not possible, but more efficient screening methods are awaited in the near future. Until then, clinical examination of family members and, in case of familial DCM, genetic counseling are recommended in the work-up of patients with idiopathic DCM.